Proudly display the noble emblem for the Alliance when you wear this cool World of Warcraft hoodie! 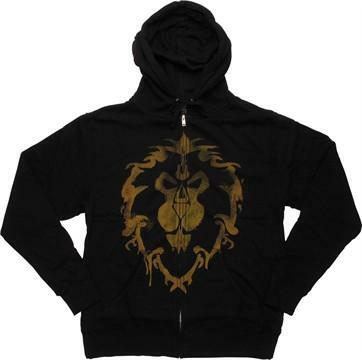 The World of Warcraft Alliance Logo Hoodie is black with a distressed print and a full-length zipper closure. This warm and comfortable hooded sweatshirt features a large version of the symbol for the Alliance in the videogame series World of Warcraft, a noble lion with a golden mane!